Successful gut renovations like White Pine Canyon IV require meticulous planning and an experienced team. Jaffa transformed this 1980s house with multiple incongruous styles into a bright, fresh, harmonious home for a young family new to Park City. A vintage front door welcomes guests into the living spaces that are accentuated with ceiling beams and an open floor plan finished with light, serene colors and traditional touches including a custom limestone fireplace. 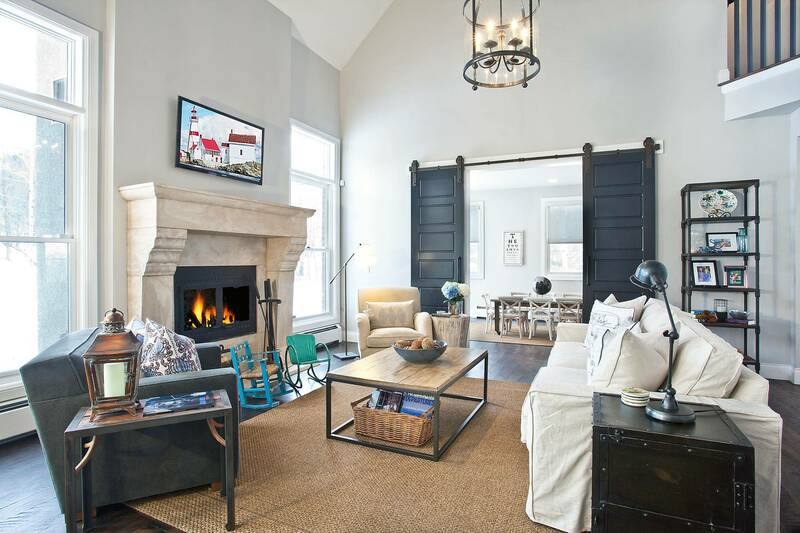 Barn doors stretching ten-feet tall open the play room up to the family room, breakfast area and kitchen. The kitchen island’s grey palette perfectly complements the Carrera countertops and the barn doors. Using white marble, painted wainscoting and dark floors unifies the East Coast aesthetic sought by the owners.